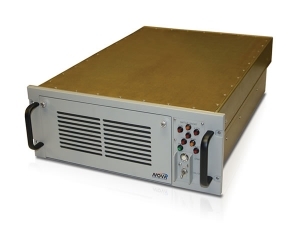 The Nova Integration Solutions (NIS) Class 4100 contains a portfolio of convection cooled military tested reference designs which incorporate state-of-the-art design and features tailored to specific applications or environment conditions. Mil-grade chassis models are available in 1U through 12U rack heights, support various types of passive backplane types, PICMG, motherboards or single board computers. Popular backplane types supported include VME, VME64x, VXS, OpenVPX, etc., CompactPCI, PCIe, PXI, or active motherboards in ATX or Server form factors; completely custom / hybrid host board form factors are also supported. Hallmarks of NIS military-grade chassis products are superior structural strength, virtually non-existent torsional flex, scalability, low cost of ownership, low maintenance, aggressive or controllable airflow, and low MTTR. Each chassis family has undergone Finite Element Analysis (FEA) to fully optimize mechanical design. NIS’s engineering process also includes static and dynamic analysis to determine natural frequency, a critical step in characterizing vibration and shock performance. Some models accommodate NIS’s System Health Monitor (SEM), a microcontroller-based, I2C monitoring system that monitors and controls key chassis parameters to ensure optimal operating conditions are maintained. Via local or remote communication ports, SEM’s HTTP and SNMP protocols result in fast and simple setup. Temperature is monitored; fan speed is controlled; input and output power levels are monitored. System power-down under a fault condition may be enabled or disabled, or Battlefield Short operation may be enabled. Model 4105 5U Coming Soon! Model 4106 6U Coming Soon! Model 4108 8U Coming Soon! Model 4109 9U Coming Soon! Model 4110 10U Coming Soon! Model 4111 11U Coming Soon! Model 4112 12U Coming Soon! Temperature rating can change due to application, environmental conditions or integrated components. EMI Filtering MIL-STD-461 compliant EMI filters produced by sister company Nova Electric are included with all models. Custom and semi-custom configurations available. Visit the Custom Power Systems page for more information!